Super Hero Boy: Baby wearing made easy with Infantino and the Ecosash! Baby wearing made easy with Infantino and the Ecosash! I started wearing Connor when he was about the same age Dylan is now. I can't even tell you how much it made my life easier as I could just put on a carrier, insert Connor, and head into a store without having to worry about dragging out my stroller. It's also a great way to get stuff done when you have a super cranky teething baby and you want to hold them but still have use of your hands. The best part about baby wearing though, and the part that really gets so many moms so excited about it is the closeness and time you get to spend with your baby that otherwise might have been spent with the baby strapped into a carseat, stroller, or even a swing. I admit I've not done nearly as much baby wearing with Dylan. The main reason for that is the first few months of his life he had to stay propped up as still as possible to prevent his acid reflux from acting up. Just picking him up and bouncing him around would send him into fits of screaming that would last all day long. Just recently have we started using our carriers again and Infantino sent us their new Ecosash to try out! The Ecosash is basically a super easy to use MeiTai and though its not out on the market yet it's very similar to the Wrap & Tie already on the Infantino website. There are some features though that we have not seen on other mei tais we have tested that I really like. The first of which is it has a detachable hood which is fabulous for weather situations where you do not want your babies head exposed, or even for more discreet nursing if your one to use a front carrier for nursing. The Ecosash also includes padded shoulder straps and a unique set of loops on both sides of the carrier that make sort of a guide system so you can adjust where the ties lie against the babies leg by how big the baby is, its really cool. As well the fabric panel on the back is reversible so you can change the look and there is a pacifier loop as well. Just a few little features that makes this mei tai very unique compared to some of the other more expensive options out on the market. Personally I found the Ecosash super easy to use and very attractive. Though its a little bit bulkier than the Mei Tai I usually wear with the padded shoulders, its very comfortable and one of the most beginner friendly Mei Tais I've ever tried out. 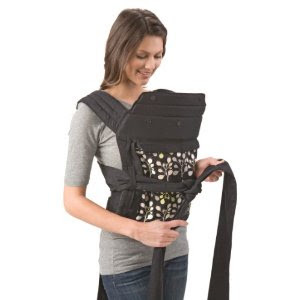 Though this type of carrier is not my favorite for newborns it's by far my favorite carrier for babies 6m+ and toddlers as wearing them on your back is especially comfortable. I used to take three mile long walks with Connor strapped on my back in a Mei Tai and it never hurt my back and it was far less work than carrying him in my arms or even on my hip like I do with a sling carrier. You can learn more about the Infantino Ecosash and their other Wrap & Tie carriers on the Infantino website!